!! 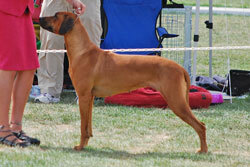 MTOTI GAINS HER CHAMPIONSHIP TITLE JANUARY 2010 !! even though she has been shown sparingly. Many thanks to Jodie Allan who has been expertly showing Mtoti for me. "Mtoti's" name means “sweet” in Swahilli, she is a very sweet girl with a beautiful temperament. Mtoti has made her show debut, winning a Baby Puppy in Group, and following up the next week, at the RRCV Open Show, winning Baby Puppy in Show (her brother Zakia won Opposite Baby Puppy in Show). Mtoti shows great promise and look forward to her developing into a fine example of the breed.